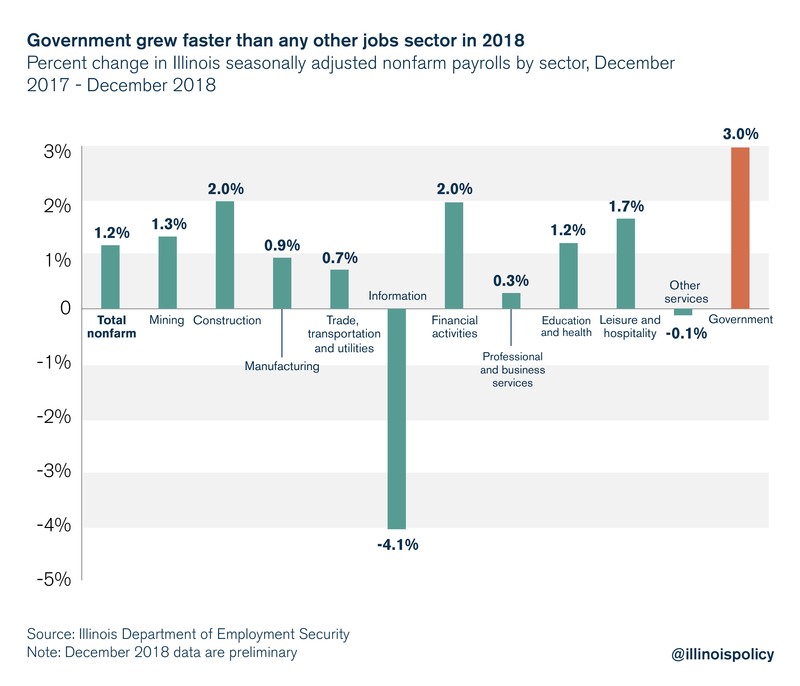 Illinois’ fastest-growing jobs sector in 2018 was government – another sign the state needs pro-growth reforms to keep up with the rest of the country. Poor economic policies continue to drag down Illinois’ labor market. Illinois’ 2018 private sector jobs growth of less than 1 percent ranked 46th out of 50 states, according to preliminary monthly jobs data released Jan. 17 by the Illinois Department of Employment Security. Nationwide, labor markets picked up steam throughout 2018, and Illinois saw slight increases in total jobs growth and private sector jobs growth compared with 2017. But it is clearly lagging its peers. Overall, Illinois added 71,000 new jobs to payrolls in the public and private sector over the year. But the largest portion of this growth came from the government sector. Government added 24,700 jobs in 2018, with the vast majority (23,800) coming from local government hiring. Local government alone added more jobs in Illinois than construction (4,400); manufacturing (5,500); trade, transportation and utilities (8,700); and professional and business services (2,700) combined. 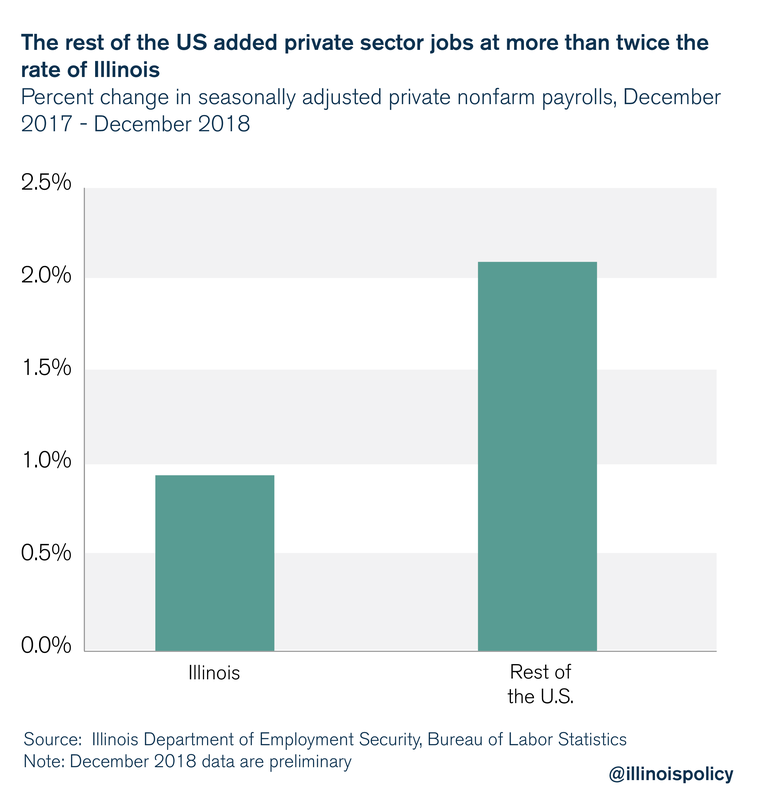 It’s important to note that because the data are preliminary and subject to measurement error, it is possible Illinois’ private sector didn’t see any uptick in jobs growth over the year. 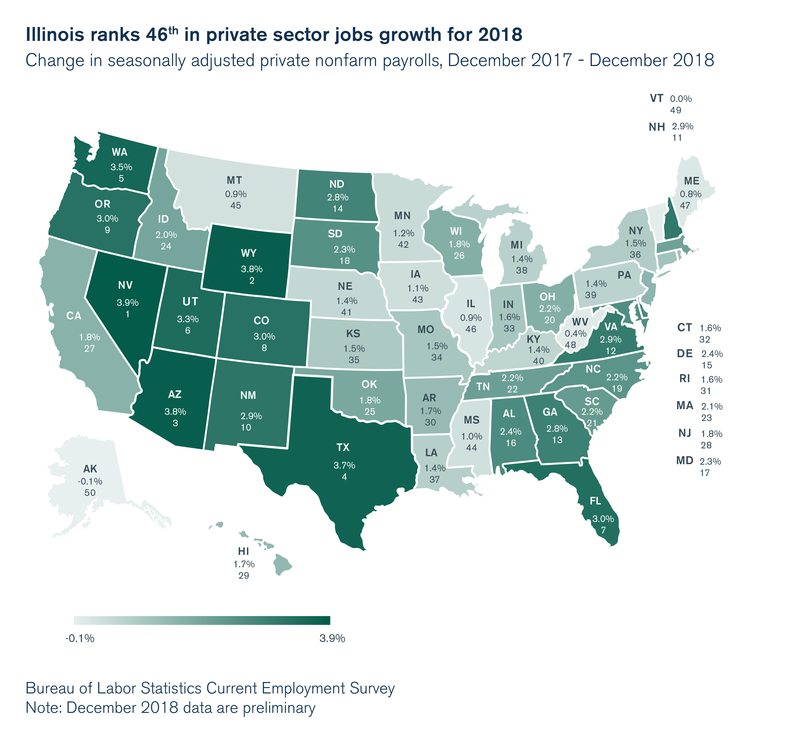 Private sector jobs growth throughout the rest of the nation surpassed Illinois, further widening the gap between the Prairie State and its peers. Additionally, the 4.3 percent unemployment rate in Illinois remains higher than the national average of 3.9 percent. Illinois’ labor market has been crushed by the state’s unfriendly tax policy and business climate, and it has become the primary reason Illinoisans are fleeing the state for greener pastures. 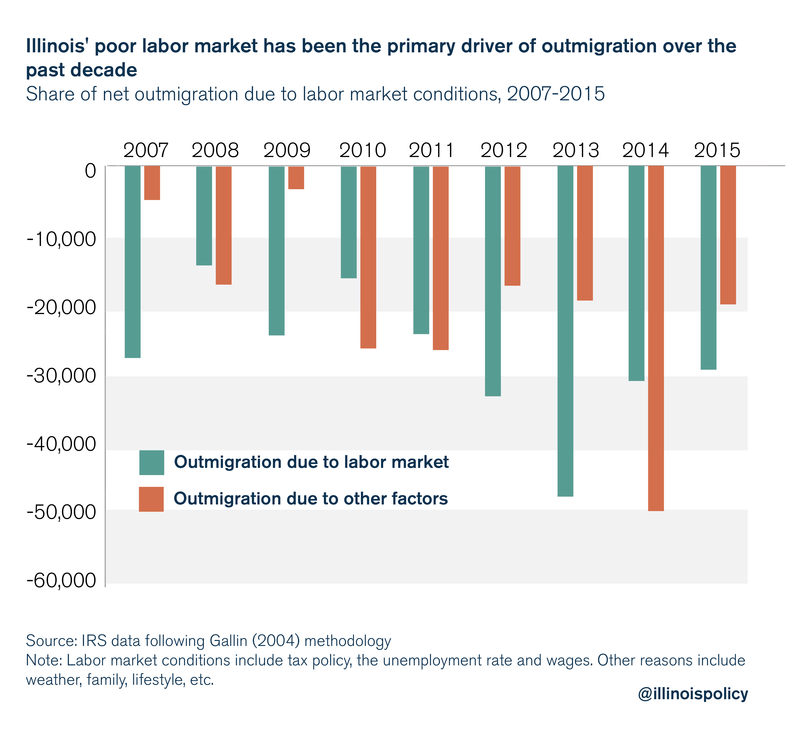 Following the methods of Federal Reserve economist Joshua Gallin (2004), which take into account the effects of climate, age and labor market conditions on migration decisions, IRS data reveal Illinois’ poor labor market has been the primary driver of outmigration since 2006, accounting for 57 percent of Illinois’ net migration losses to other states (see Appendix A). As the natural increase in the population has slowed, outmigration of residents to other locales has become even more detrimental to the state, and has resulted in five consecutive years of population decline. In 2018, the population shrank by roughly 45,000 people, primarily due to the exodus of 114,000 Illinoisans to other states. Since population decline began in 2014, Illinois has lost 157,00 people – the equivalent of the entire city of Joliet, Naperville or Rockford (the third-, fourth- and fifth-largest cities in the state, respectively). As the population declines, investment within the state is likely to continue to suffer. Investment occurs in significant part to provide capital for new workers and to provide housing for new families. If the growth rate of new workers and new families slows or even declines – as in Illinois – one should expect the level of investment to decline. A decline in investment makes capital scarce. And capital is an essential ingredient to improvements in living standards. When productive capital becomes scarce, output per worker (labor productivity) declines, hiring slows and so do wages for new hires. Historically, productivity growth has led to gains in compensation for workers and greater profits for firms. Illinois state lawmakers have the opportunity to put the state on a path toward a more prosperous future through policy reform. First, Illinois’ sluggish labor market makes it imperative that state politicians resist the urge to raise taxes, even as rising state and local pension costs make this a tempting course of action. Tax hikes have already contributed much to the lackluster labor market, and further increases would cause investment to decrease further, thus worsening the state’s lagging economy. Instead of looking to an economically harmful progressive income tax for increased revenue, Gov. J.B. Pritzker should seek to control the chief cost drivers of state government in 2019. Reining in government spending through a spending cap could provide certainty about future government spending and help lawmakers avoid tax hikes to balance the budget. In addition, controlling pension costs is a critical component of holding down spending. Pension obligations, which official estimates put at $133 billion and other analyses peg at as much as $250 billion, are one of the largest cost drivers of government spending and now eat up more than a quarter of the state budget. This means Illinoisans are paying more for government worker retirement costs, and fewer dollars are available for core services. And despite paying billions of dollars a year into the state retirement systems, these funds are becoming less solvent over time, as returns on investment are frequently below their projected targets and 3 percent compounding benefit increases outpace inflation. An amendment to the Illinois Constitution that protects current earned benefits, but allows for a slower growth in accrual of future benefits – such as a true cost of living adjustment tied to inflation – would help to reduce the state’s pension debt. Bringing spending down to a level taxpayers can afford and avoiding tax hikes would foster better employment growth within the state through a friendlier business environment that encourages more investment and job creation. A lower tax burden would stimulate investment and job creation, making the state a more attractive place for families and businesses to plant roots. If Illinois policymakers tackle necessary spending reforms, the state might look forward to a day when it no longer lags the rest of the nation in employment growth.